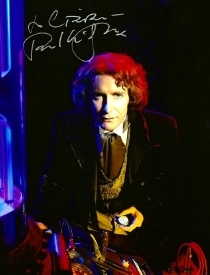 Paul McGann was born in Liverpool in 1959, the 2nd eldest of four brothers - the other three, Joe, Mark and Stephen are also well-known actors. They also have a sister, Clare. The four brothers formed a rock group called 'The McGanns' and released a single Shame About the Boy in September 1983. 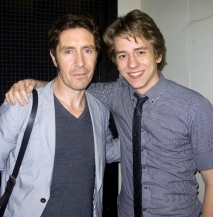 Paul McGann trained at RADA, and has acted almost continually since leaving there in 1981. He appeared as John the Baptist in Godspell at the Nottingham Playhouse in 1981, and co-starred with his three brothers in the West End musical review Yakety Yak in 1982. 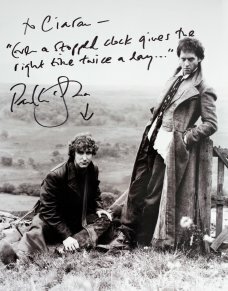 More recent occasions that Paul McGann has been seen on the big screen include the films The Queen of the Damned (2002); the Dogme film Gypo (2005); Poppies (2006) and Always Crashing the Same Car (2007), where he teams up again with Richard E Grant. 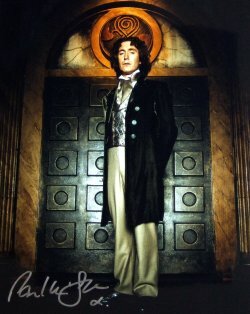 Paul McGann has a fine voice for audio book narration and has done audio versions of some of Cornwell's Sharpe novels and also some Doctor Who adventures. 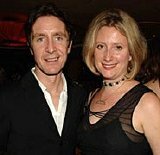 A favourite Paul McGann series for many TV viewers was the four Hornblower productions (2001 & 2003), based on the books by C S Forester. 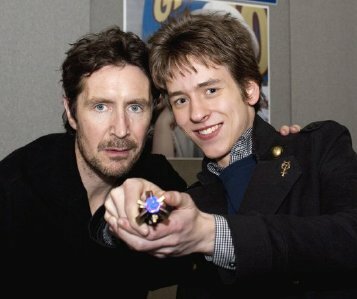 Paul McGann played Lieutenant Bush, along with a cast of well-known British actors that included Ioan Gruffudd and Robert Lindsay. 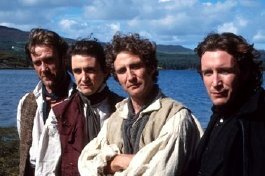 That same year, The Hanging Gale (1995) saw all four McGann brothers appearing together for the first time since Yakety Yak in 1982. They played the Phelan brothers struggling to save their farm, and their family, from the ravages of the Irish potato famine in 1846. 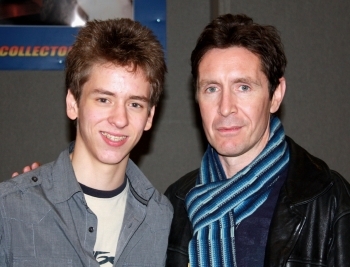 I was really looking forward to meeting Paul McGann at Collectormania held at Coventry in November 2008. He was so friendly and easy to talk to. 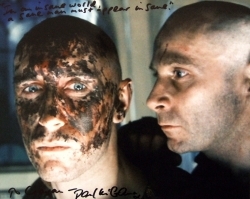 He signed a photo, a Masterprint from Alien 3 and two Doctor Who items for me. He also gave a talk about his acting career and answered questions put to him by the audience. the BBC TV 4-part series The Monocled Mutineer (1986) that he gained a wider public recognition. Ken Russel's adaptation of D H Lawrence's The Rainbow (1989), Golic in Alien 3 (1992) (where most of Paul's scenes were cut from the final print) and the dual roles of Girard and Jussac in The Three Musketeers (1993). novels. During filming of the first story Sharpe's Rifles, McGann was injured playing football. His role was taken over by Sean Bean who went on to make another thirteen more Sharpe! 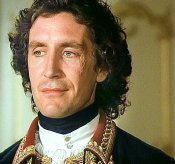 In 1995, McGann played Potemkin in Catherine the Great, alongside a star studded cast that included not only his brothers Mark and Stephen, but the likes of Catherine Zeta-Jones, Ian Richardson, Brian Blessed, John Rhys-Davies and Omar Sharif. dropped. 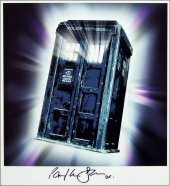 It was to be another nine years before Doctor Who returned, with Christopher Eccleston in the role. patrol Bravo Two Zero to escape after attempting to destroy Scud missiles trained against Israel during the first Iraq war. Around this time Paul appeared in a couple of Agatha Christie stories - Sad Cypress in 2003 and Sleeping Murder in 2006. (1998); the crime thriller Forgotten (1999); the BAFTA-nominated Nature Boy (2000) and The Biographer (2002) in which he plays Andrew Morton, Princess Diana's biographer. Louis Stevenson's Kidnapped (2005) saw Paul McGann playing the role of the ruthless English villlain Colonel MacNab. included the thrillers Lie With Me (2004) and If I Had You (2006) also the six-part mystery series with Pooky Quesnel and Dervla Kirwan True Dare Kiss (2007). A curiosity was Kenneth Branagh's 2-character short film Listening (2003), with very little dialogue between the two characters played by Paul McGann and Frances Barber. 1998 he played the psychiatrist Jung in Sabina at the Bush Theatre. In 2003, he was in two plays - Little Black Book with Susannah Harker at the Riverside Studios, and Mourning Becomes Elektra with Helen Mirren on the Lyttleton stage at the National Theatre. Another stage appearance was in The Gigli Concert in 2005 at the Finborough, a tiny theatre above a pub in Earl's Court. In August 2011, I saw Paul in the West End revival of the comedy Butley at the Duchess Theatre, also starring Dominic West in the title role. Afterwards Paul signed my programme and I had another photo with him at the stage door. of the excellent police drama Luther (2010-11) in which he played the character Mark North. Coincidentally, his next TV role, as DCI James Larsen, came in Object of Desire (2011) an episode of another long-running 'cold case' police drama New Tricks. 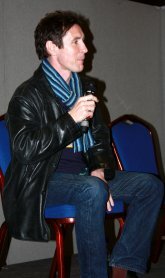 Paul McGann has also been much in demand for voice-over work in Britain in recent years, particularly for television commercials and documentaries. I was delighted to meet Paul again in November 2010, this time at Collectormania London held at Olympia. It was the end of the afternooon and dad and I were able to chat with him for about twenty minutes, mostly about acting. I met him yet again in October 2011 at the Entertainment Media Show at Earl's Court, where I was taking photographs of the guests for the show's organisers. 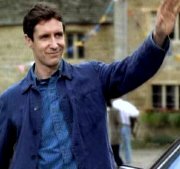 police drama Waking the Dead (2000-2011),MPaul McGann guest stars as a senior-ranked 'bent cop', ACC Tony Nicholson.